The enterprising engineer can find inspiration in anything. For a group of graduate students from the Cockrell School of Engineering at The University of Texas at Austin, under the guidance of associate professor of mechanical engineering Chris Rylander, it was the design of a Slurpee straw. 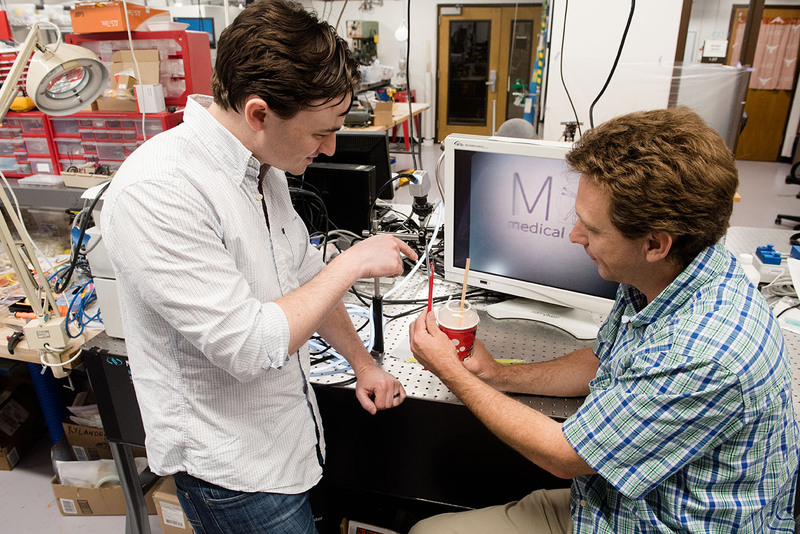 Mechanical engineering graduate student Chris Idelson (left) and mechanical engineering associate professor Chris Rylander work on their in-body cleaner for a laparoscope (a fiberoptic camera tool used during minimally invasive surgery), which was inspired by a Slurpee straw. Rylander and his team were inspired by the straw’s scoop-like end to come up with a much-needed solution for doctors — an in-body cleaner for a laparoscope, a fiberoptic camera tool used during minimally invasive surgery. Improving upon existing prototypes, the researchers’ laparoscope cleaner uses a special geometrically altered polymer that can be controlled externally to remove any unwanted material from the lens that may be blocking a surgeon’s view. When needed, the surgeon can actuate the cleaner by opening up the polymer tip and scraping any unwanted material from the lens without scratching it. This invention, which is patented (pending) by UT Austin, led to Rylander’s medical device startup ClearCam Inc. to commercialize the technology. A few months ago, the team paired up with an entrepreneurial advisor in the Cockrell School’s Innovation Center, Doug Stoakley, who is now the company’s COO. In April 2018, Chris Idelson, a mechanical engineering Ph.D. candidate and co-inventor of the technology, and Egleide Elenes, a biomedical engineering Ph.D. candidate and member of Rylander’s lab, took home $175,000 for ClearCam in the prestigious Rice Business Plan Competition hosted by Rice University. ClearCam was the only team from Texas to take home major prizes and was fourth in total prize money behind MIT, Harvard and the Birla Institute of Technology and Science. The company won the $150,000 Houston Angel Network Investment Prize and the $25,000 Texas Business Hall of Fame Best of Texas Prize.